A two-floored catacomb identified as a Jewish burial site was discovered in northern Rome under Villa Torlonia, a 19th-century villa with vast gardens. The villa was once owned by the Torlonia family but was used by Benito Mussolini when he lived in the city. The catacombs were discovered in 1919 when the villa was being restored but they lay vacant and unattended, becoming easy prey for looters and vandals. “Most of the tombs had been smashed open and looted, with the bones strewn around the floor, and anyone who went in could walk on them and crush them,” Yuval Baruch, an archaeologist with the Israel Antiquities Authority (IAA) leading the restoration project told Haaretz. Archaeologists believe the catacombs were used between the 2nd and 5th centuries CE to bury some 4,000 bodies, though some believe the catacombs were used even before that. In ancient times predating Christianity, it was a Jewish practice to bury in catacombs and some archaeologists conjecture that Jews migrating to Rome after the destruction of the Temple introduced the practice to the Romans. The size and length of time the catacombs were used suggest that the city was host to a large Jewish community throughout that period. The catacombs of Villa Torlonia were made up of loculi, rows of niches carved into the limestone and then sealed with plaster. The cover would often be inscribed with the name of the deceased and also prayers. The wealthy were buried in arcosolia; larger arched chapels carved into the stone. The walls and ceilings of the arcosolia were decorated with Jewish motifs such as menorahs and the Ark of the Covenant, or symbolic fruits like the pomegranates and the etrogs (one of the four species used during Sukkot – Feast of Tabernacles). In 2005, the Italian Culture Ministry had approved the $1.6 million restoration plan for the catacombs but work could not proceed due to objections raised by Atra Kadisha (holy society), a Jewish burial society based in Israel. The Italian authorities have allowed the Jewish burial society to collect the bones that have been scattered in the catacomb and replace them in the loculi, resealing the niches with plaster. Archaeologists who wanted to use the bones for research petitioned the Italian Cultural Ministry, requesting that the activities of the burial society be stopped and that they be given access to the bones. The IAA joined the project following the protests. Baruch said that his organization was positively impressed when they inspected the site during the reburial work last year. Daniela Rossi, the archaeologist overseeing the project on behalf of the Italian Culture Ministry, explained that the decision to allow Atra Kadisha to precede the archaeologists was made because Italian law recognizes and respects Jewish burial customs. The archaeologists could not begin work on the site until all the bones were properly taken care of. Caring for the dead and burying their remains is a powerful Torah imperative that transcends simply honoring the dead. Individuals who have passed away and have no one else to take care of their burial are referred to in Jewish law as meit miztvah. The Torah commandment to care for their remains is so important that it supersedes most other commandments. 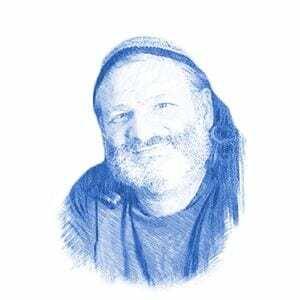 As chairman of ZAKA, Yehudah Meshi Zahav is very familiar with the issues concerning Judaism’s caring for the dead. His organization deals with emergency medical and disaster response but after the emergency is over, ZAKA volunteers can be seen working with forceps to carefully recover every tiny scrap of tissue from the scene. Zahav recognized honoring the dead as a Jewish value but he has seen it adopted in the U.S.
Zahav explained that honoring the dead is also important for those who are grieving. Zahav referred to Hadar Goldin and Oron Shaul, two IDF soldiers who fell in the 2014 war in Gaza. Hamas is holding their bodies for ransom and their families are still petitioning the government for their return. Rabbi Yosef Berger, the rabbi of King David’s Tomb on Mount Zion, explained that honoring the dead has implications for post-Messianic times. Atra Kadisha has finished their holy work and restorers will begin work next month on conserving the frescoes. The site will be opened to tourists sometime next year. Confrontations between archaeologists and Chevra Kadisha are not uncommon since they have contradicting beliefs in how to relate to bones. Last year, Dr. Scott Stripling, an archaeologist and provost of The Bible Seminary in Texas, was exploring a cave complex at Khirbet el-Maqatir near the city of Ofra in Samaria where he has been the co-director of the dig for 20 years. In 2013, he discovered bones belonging to Jews murdered in the first revolt in 69 CE at the hands of the Romans. Dr. Stripling was approached by the chevra kadisha of Ofra who requested that after he finish his research, they be permitted to bury the bones in a Jewish cemetery. Dr. Stripling complied, but after the bones were buried, the Israeli authorities intervened, threatening to dig up the bones and remove them from the cemetery.